ASP.NET Scaffolding is a new feature that is included in Visual Studio 2013. By default, Visual Studio 2013 does not support generating code for a Web Forms project, but you can use scaffolding with Web Forms by either adding MVC dependencies to the project or installing an extension. Both approaches are shown below. Visual Studio 2013 Update 2 (currently RC) provides the ability to extend ASP.NET Scaffolding to meet the requirements of your scenario. With this functionality, you can create a customized scaffolding template and add it to Add New Scaffold dialog. Within the customized template, you specify the code that is generated when adding a scaffolded item. For more information, see Creating a Custom Scaffolder for Visual Studio. To add a scaffold, right-click either the project or a folder within the project, and select Add – New Scaffolded Item, as shown in the following image. From the Add Scaffold window, select the type of scaffold to add. The Add Controller window gives you the opportunity to select options for generating the controller, including whether you want to use the new async features from Entity Framework 6. The relevant classes and pages are created for your scenario. 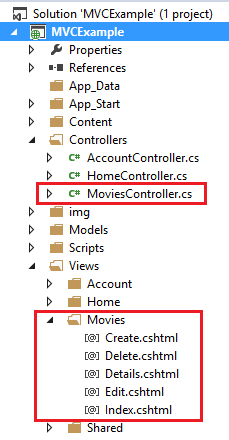 For example, the following image shows the MVC controller and views that were created through scaffolding for a model class named Movies. To add scaffolding that generates Web Forms code, you must either install an extension to Visual Studio or add MVC dependencies. Both approaches are shown below, but you only need to do one of these approaches. You can install a Visual Studio extension that enable you to use scaffolding with a Web Forms project. In Visual Studio, select Tools and then Extensions and Updates. From this dialog search the Visual Studio Gallery for Web Forms Scaffolding. For more information, see Web Forms Scaffolding. 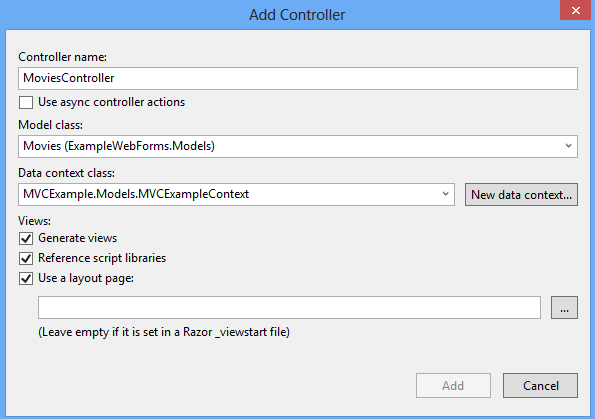 To add MVC dependencies, select Add - New Scaffolded Item. 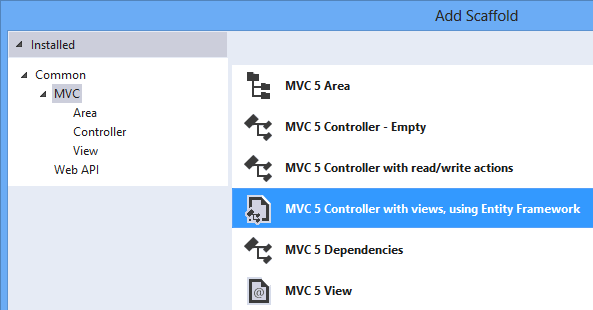 In the Add Scaffold window, select MVC Dependencies, as shown below. There are two options for scaffolding MVC; Minimal and Full. If you select Minimal, only the NuGet packages and references for ASP.NET MVC are added to your project. If you select the Full option, the Minimal dependencies are added, as well as the required content files for an MVC project. To easily use scaffolding, select Full dependencies. After adding the dependencies, you will see a readme.txt file. Carefully follow the instructions in this file to ensure that your project works correctly. When you have completed the steps in the readme.txt file, you can add a new scaffolded item as shown in the previous section about MVC and Web API. The automatically-generated views and controller will function correctly within your project. To create a customized scaffolder, see Creating a Custom Scaffolder for Visual Studio. To customize the generated files, see How to customize the generated files from the New Scaffolded Item dialog. For an example of using scaffolding with Database First development, see EF Database First with ASP.NET MVC. For an example of using scaffolding in an MVC project, see Getting Started with ASP.NET MVC 5. For an example of using scaffolding in a Web API project, see Create a REST API with Attribute Routing in Web API 2.